Fans and celebrities are taking to social media to mourn and celebrate Hollywood legend Elizabeth Taylor. The news rapidly spread across the web early Wednesday morning via Twitter and Facebook. Later, Twitter's Top Trending Topics included "RIP Elizabeth Taylor," as thousands of fans left comments. Celebrities also took to the social media site, where Taylor tweeted following a heart procedure in October, "It's like I have a brand new ticker. Thank you for your prayers and good wishes." "Elizabeth Taylor was a great friend, a great star and one gutsy woman. She was so special. You won't see the likes of her again," Larry King tweeted. "Sad to hear of Elizabeth Taylor's death. She was the 1st major celebrity to join me in the fight against AIDS when it wasn't a popular cause," wrote Joan Rivers. Jeff Rosen posted Elton John's comments on his feed, "We have just los a Hollywood giant; more importantly, we have lost an incredible human being." LaToya Jackson said via CNN, "Liz Taylor was an incredible friend to my brother at his side through some of his most difficult times..."
You can leave comments on our Facebook page. You can also email us photos or videos using the links below. 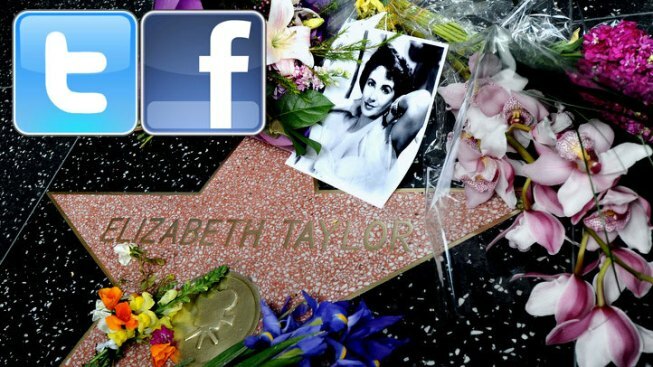 An Elizabeth Taylor Facebook page was also flooded with R.I.P. messages and memories of the star. As of early Wednesday, the page had over 30,000 "likes." "Such a stunning woman....timeless beauty. Sad to have her go.....a real legend," wrote one user. Taylor's death at age 79 came just days after being declared in stable condition at a Los Angeles Hospital. The actress and style icon had been checked into Cedars-Sinai Medical Center in Los Angeles since early February with symptoms of congestive heart failure. After weeks of showing slight improvement, Taylor finally succumbed to the illness.